How Many Calories in Bananas? 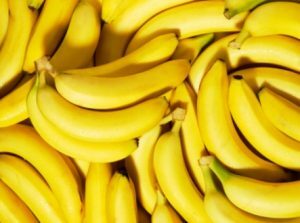 How Healthy are Bananas? Bananas are one of the healthiest and most popular fruits in the world. People generally know they’re good for you but many wonder how many carbs and calories do they actually contain. That’s what I am looking at in this article. A medium-sized banana contains about a hundred and five calories on average but of course, it depends on the size. The smaller the size, the lower the calorie content. The smallest is typically around 70 calories and then you go up to the biggest which are about 135 calories. So just about double one cup of sliced banana is about 134 calories and a cup of mashed is about 200 calories. So if you’re unsure about the size you can estimate that on average it’s about 100 calories. How many carbs are in a banana? Bananas are almost exclusively carbs and water only about 3% of the calories come from fat and 4% from protein. Those who watch their carb intake are of course interested in knowing the carb content of bananas. 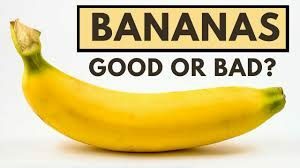 “Are bananas good for me?” Now we’ve heard of some of the great health benefits of bananas, but on the other end, I think a lot of people worry about the sugar content that’s found in certain fruits like bananas Today. I’ll tell you here, bananas, they are teetering on the edge here of the Chopping Block. Let’s talk about the negatives of bananas, and then let’s talk about the positives. The negatives, without a doubt, is that is does contain a large amount of sugar and doesn’t really have much protein or any healthy fat whatsoever along with it. One medium sized banana has 27 grams of carbohydrates, 14 of those grams are sugar, and then it contains about 1 gram of protein and 0 grams of fat. So if you’re eating a banana by itself, there’s no doubt it could affect your blood sugar levels in a small amount. So that is really the negative side of bananas is right there, is if you’re a person who’s trying to lose weight, if you have sensitive blood sugar, that bananas in terms of fruit, it’s higher on the glycemic index, which means it will typically affect your insulin more or affect your sugar more compared to most other fruits. Now let’s talk about the positives with a banana. Bananas are one of the most potassium rich foods in the entire world. One single banana has 500 mg of potassium, so it’s packed with potassium. It has 32 mg of magnesium, so it’s really loaded with electrolytes. So if you’re an athlete, if you’re a person that works out, this is an amazing food for you because, again, it can really help fuel your cells. Now another thing in defending the banana is that if you’re comparing this banana even to a bowl of oatmeal, this is still lower on the glycemic index and has a lower amount of carbohydrates than even healthier grains out there like rice, bananas, and quinoa. So again, this really is a better option compared to any other grains out there in my book. But when you’re comparing it to other fruits, like berries for instances, berries have more antioxidants, they’re higher in fiber. Berries definitely have more benefits as well as a lot of other fruits compared to a banana, but bananas are still better than grains. So what do I say about the banana in closing? Well, here’s what I would say. If you’re a person who is trying to lose weight or has some digestive issues, I really think if you’re trying to lose weight or have sensitive blood sugar, I would remove bananas from your diet, but I would still eat them before any other grains. If you’re an athlete or somebody who is already pretty lean and healthy and just trying to stay healthy, I think bananas are still a great option for you. So when it comes to bananas getting chopped, we’re going to spare the banana here, and we’re actually going to peel it here instead of chopping it. I’m actually about to go on a run, so I’m going to eat a little bit of this banana here because, again, it’s still packed with potassium, has some good amount of fiber, has magnesium, and number one thing that saved the banana, it is a real food, unprocessed, unhybridized, completely real. Again the banana is staying here on the Chopping Block. .
How Many Calories Are in a Banana Chip? How many calories are in a banana chip? This actually varies widely depending on how the banana chip was made. Some banana chips are baked, some of them are fried. So you’re going to have a wide variation in how many calories are actually in a single chip. One small banana chip, even if it’s fried, isn’t really going to have that many calories. It may have at the most, 10 calories if it’s a normally sliced banana chip. And if it’s baked, it’s probably only going to have about five. So one single banana chip is going to have very few calories. Where it will add up is if you’re actually eating a whole cup of banana chips and they were fried. That’s where you’re going to be getting closer to the 200 calorie mark. If it’s baked banana chips, it will be quite a bit less. It could be down to about 120 calories, so the main thing to look at is how your banana chip is made. Really look at that nutrition facts panel when you’re purchasing banana chips and that will tell you how many calories are in the banana chips. It usually won’t list it per chip, but it will get it to you per size. It may give the service size as half a cup, it may give it as a whole cup. 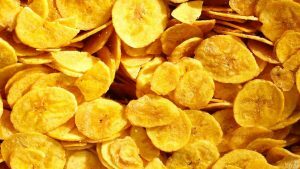 So that will be your best indicator of how many calories can be found in banana chips. How Many Calories Are in Banana Nut Bread? I have been asked how many calories are in banana nut bread. 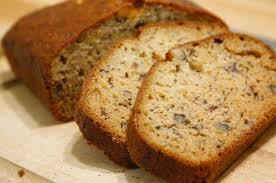 Now this can vary depending on whether it is home made banana nut bread versus store bread banana nut bread. If you are making it at home you can actually reduce the calorie content if you don’t make it with margarine, say for example you use apple sauce to substitute for part of the margarine and you use a little bit of vegetable oil that will cut the calorie level down quite a bit. You might also reduce how many nuts you are adding say it calls for a whole cup you may add only three quarters of a cup and you are going to actually reduce your calorie level quite significantly so if you put that homemade banana nut bread into a traditional loaf pan and you cut slices that are say about a half inch thick that half inch slice of your homemade banana nut bread with all of your low fat cooking techniques that you use, you are probably going to get about 110 calories from that slice. Now if you were to buy commercially prepared banana nut bread that had been made with margarine a one ounce slice is actually going to be closer to about 200 calories about 196 calories for a one ounce slice. If you were to buy the little mini loaves say for example the Keebler Elfin mini loaves of banana bread, they may or may not have nuts in them. Those are going to be about 186 calories so a pretty wide range of calorie levels depending on if you make it home made or if you buy it store bought. Here is a video of how to make banana drink to burn belly fat!